Harper’s Bazaar US got a makeover last March with bigger size and new layout designed by Robert Derrick (formerly at British Vogue) and Stephen Gan. but we think the makeover didn’t matter much on their newsstands cover. It’s still boring, repetitive, and unattractive. Perhaps, Carine Roitfeld appointment as Harper’s Bazaar‘s Global Fashion Director last October could bring something fresh to this Glenda Bailey‘s monthly edited fashion publication. But we are doubting that, until we see her first collaboration with the magazine next March. Their March, April, September and November issue are quite interesting. Maybe it’s because their sleek new fonts and a great Gwyneth Paltrow shot? Maybe it’s because Mila Kunis? Maybe because the bold pink Alexis Mabille headpiece that popped? Or maybe because the matching gold backdrop and dress? Only those four newsstands covers that stole our attention this year. The subscriber covers were quite decent this year and to be honest, they are even better than the newsstand version. Our favourite pick for subs are Rihanna‘s August, Gwen‘s September and Kate Hudson‘s October issue. The rest of the cover star slot were given to Demi Moore/February (Ugh, worst cover of the year! ), Penelope Cruz/May, Kate Moss/June-July, and Taylor Swift/December-January 2013. Check out our recap from last year, here and 2010, here. Share to us your favourite cover image from Harper’s Bazaar US this year in the comment box below. UPDATED MARCH 10th 2012: Added another subscriber cover version featuring Heidi Klum photographed by Thomas Whiteside. Image via TFS. UPDATED MARCH 09th 2012: Added the newsstands cover that’s also photographed by Carter Smith and styled by Joe Zee via TFS. The pose is not new, you’ve seen it on the August 1991 cover of Vanity Fair with Demi Moore (shot famously by Annie Leibovitz) and Claudia Schiffer on the cover of Vogue Germany June 2010 (by Karl Lagerfeld). She is definitely channelling the first. Elle US should’ve done it differently. Maybe something like that August 2006 cover of Harper’s Bazaar US with Britney Spears who was snapped fabulously by Alexi Lubomirski? They could’ve do something better than this. Meh. Click here to view last year cover featuring Amanda Seyfried and here for 2010 cover featuring Taylor Swift. UPDATED JANUARY 09th 2012: Added the subscriber cover via TFS. This is a subtle different than usual cover of Harper’s Bazaar US lensed by Cedric Buchet. We are looking forward to see their new issue next month as they will make a major makeover so we heard..
Click here to view last year cover featuring Nicole Kidman and here for 2010 cover featuring Miley Cyrus. As always, Glamour US covers are using white backdrop. It’s really predictable but somehow they’re pulled it off with the cover stars selection, great styling and colorful texts and masthead. This year, Netherlands born photographer, Matthias Vriens-McGrath, tops the numbers of the front pages he photographed for the magazine that was founded in 1939 with total five covers! His first 2011 works was Kate Winslet‘s April issue in which the then 35 year old Academy Award winning actress flaunting her fab figures and posed in a Herve Leger by Max Azria dress. His second cover was for May edition with three rising actresses in flower printed ensembles: Ashley Greene, Emma Stone and Freida Pinto. Heidi Klum—with her signature grinning—graced their annual Jeans Issue in August while Kristen Stewart fans are happy and rejoiced to see the 21 year old Twilight star featured for the November cover with one of the most unique posing I’ve ever seen in a magazine cover. Matthias Vriens-McGrath last cover this year was for December issue featuring newly single Jennifer Lopez in a red bustier from Chloë Sevigny for Opening Ceremony and pants from Salvatore Ferragamo. The issue will hit newsstands on November 08th and I will surely get this as usual. 57 year old Ellen von Unwerth who worked as a fashion model for 10 years before moving behind the camera, photographed three covers (two of them are the year’s most important issues! ): January issue with Reese Witherspoon (in Burberry Prorsum dress), March issue with Diane Krueger (in Chanel jacket) and the flame haired Rihanna for September edition (in Dolce & Gabbana top and pants). The February and July covers with Kim Kardashian (in a pajamas by Tom Ford) and Blake Lively (in Michael Kors sequined tunic) respectively, was the works of Terry Tsiolis, who already lensed the covers of Muse, Elle UK, Dazed & Confused and Vogue China. The last two front pages, June (Olivia Wilde) and October (Jennifer Aniston, Demi Moore and Alicia Keys), are the works of English photographer Ben Watts, and Elle US regular photographer, Alexei Hay. Unfortunately, the October issue is my least favourite cover. I’ll tell you guys something. I’m a guy, but I really enjoyed reading this Cynthia Leive edited monthly publication. Attractive covers, great layout, colorful bold texts and amazingly witty yet informative articles are really a perfect combination. I also loves the covers line up this year which is better from last year, IMO. 48 year old Demi Moore is featured for the Holiday 2011 campaign images of Ann Taylor photographed by Norman Jean Roy with the hair done by Duffy. Click here to view her Fall Winter campaign images of the brand. 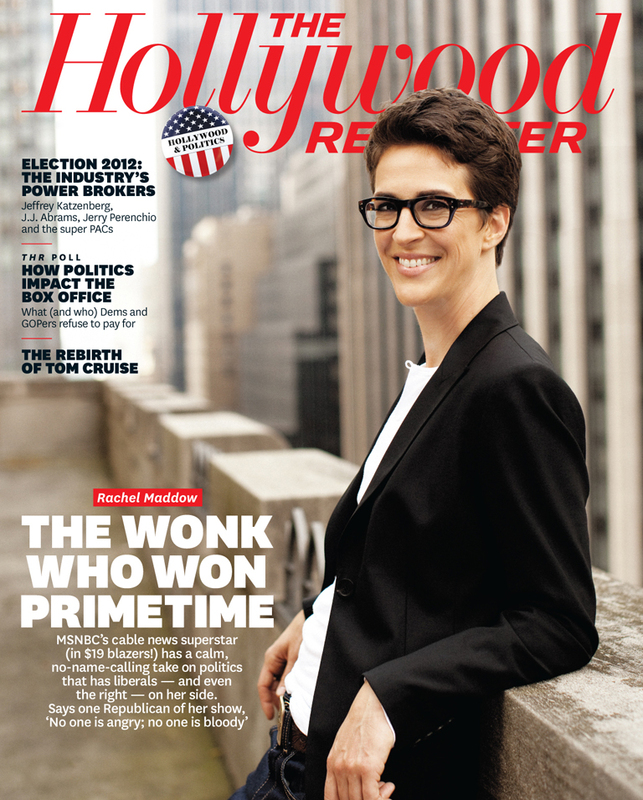 38 year old American television host and political commentator, Rachel Maddow is featured for the latest cover slot of The Hollywood Reporter. 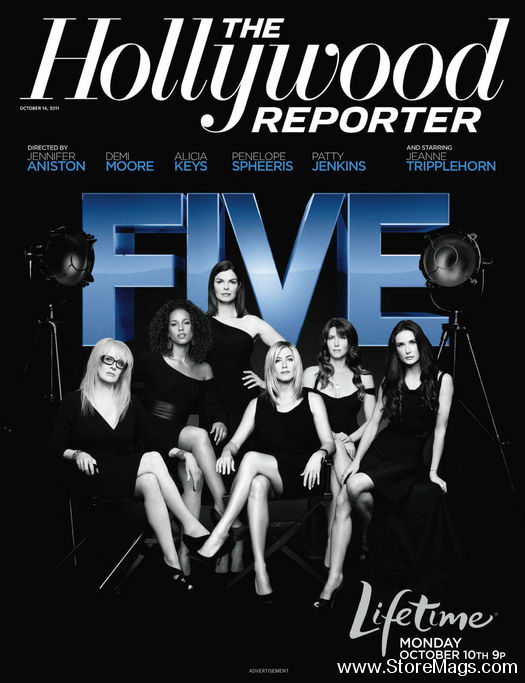 Below are the advertisement cover featuring Penelope Spheeris, Alicia Keys, Jeanne Triplehorn, Jennifer Aniston, Patty Jenkins and Demi Moore promoting ‘Five‘. Images via Hollywood Reporter and Store Mags. 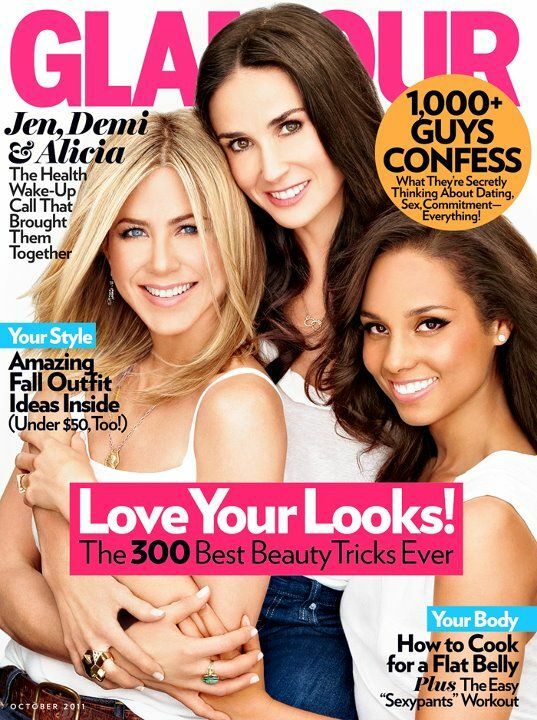 Jennifer Aniston, Demi Moore and Alicia Keys are gathered in the front page of the October issue of Glamour US! Demi Moore is replacing Katie Holmes as the new face of Ann Taylor photographed by Patrick Demarchelier on the top of Rochefellar Center Gardens in NYC. Previous campaign faces including Naomi Watts and Milla Jovovich. Demi Moore and his husband, Ashton Kutcher were boo-ed when they walked the red carpet of São Paulo Fashion Week couple of days ago because they were late for nearly three hours!!! BOOOOOOO!!!! !